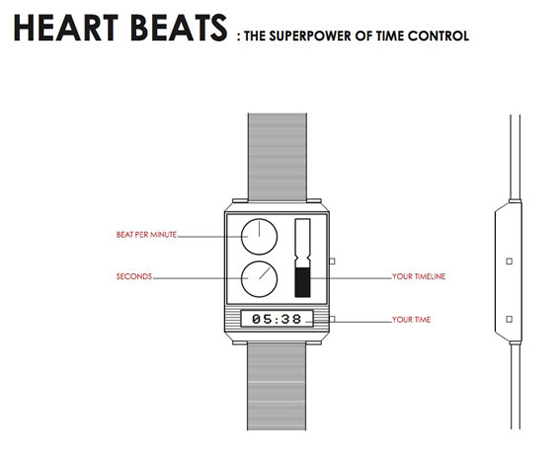 “Heat Beats” is a wrist watch which keeps time in tandem with your heart rate. The faster your heart rate the faster the watch will tick, the slower the heart rate the slower the watch will move forward. It is a body-aware device which lets you into a rhythmic and key aspect of your physiognomy, also clearly displaying your heart rate—an indicator of rest, excitement, exercise etc.—in such a way that we can be more aware of present state. 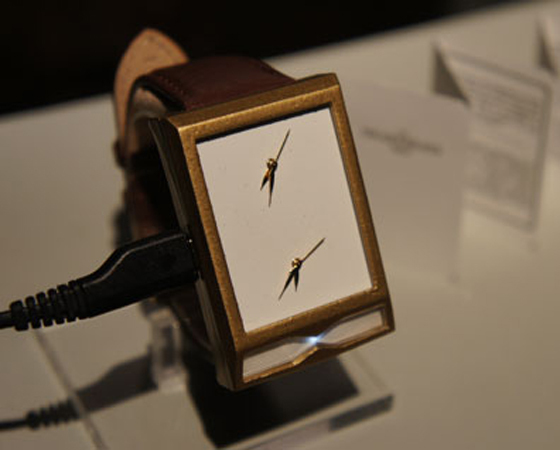 If we map the history of wearables—one of the earliest instantiations is the wrist watch. Before being worn on the wrist, the watch was considered a “female” accessory and was worn around the neck in elaborate jeweled encasing. Watches worn on the wrist were later popularized by Germans soldiers in WWI for coordinated military operations. However, the proliferation of time pieces on the body and in urban areas also elicited a number of unease and controversy as Stephen Kern in his book “The Culture of Time and Space” describes. The onset of having access to the knowledge of precise time caused a controversy over “health risk” of perceptions of passing of time, which was perceived as stressful to the general populace. Is “Heart Beats” meant to be stressful, or comforting? Actually developed under the working title of “The SuperPower of Time Control” the watch is a tool of self-awareness and a thing of wonder. How does “Heart Beats” work? “Heart Beats” monitors the wearer’s heartbeat with a sensor located in the watch strap, under the wrist, and modifies the speed of the clock dial according to an algorithm based on the wearers ‘regular’ heartbeat, which is calculated in the first few days of wearing the watch. As the watch lives in the realm of the subtle and the tactile, clear mappings and digital representations would be impractical and unwelcomed. Have you considered making “Heart Beats” context aware, similarly to Christian Nolde’s “Bio Mapping” project where he tracks Galvanic Skin Responses in different city locations to show how certain areas and intersections, for example, are more stress inducing? As the watch lives in the realm of the subtle and the tactile, clear mappings and digital representations would be impractical and unwelcomed. A possibility that has been explored and needs further thought is the feeding of the data of individual watches into ‘family clocks’ or ‘group clocks’ where the time of each individual in the group is represented by a dial. The implication of transmitting such private information to a larger public sphere, and the effects of comparison of individual beats needs to be further explored. The aesthetics and the concept cannot be separated, as both are vital to the piece and have evolved together, informing each other, all throughout the process. “Heart Beats” is also a beautiful piece of jewelry, can you describe the aesthetics and how it was made? Actually, the watch is not ‘also a beautiful piece of jewelry’ it is, first and foremost, a desirable object, (and as such can be described as beautiful jewelry). The aesthetics and the concept cannot be separated, as both are vital to the piece and have evolved together, informing each other, all throughout the process. Inspired by traditional watches, the materials and weight were important factors in the process, as were technical requirements for the electronic components and manufacturability. Technically, the casing was made through a 3d print in wax, cast into brass, which was polished and gold-plated. Before arriving at the final casing, sketches and cardboard models were made, and a plastic print was produced from the first version 3d CAD model. The bracelet was hand crafted in leather around the sensor, thanks to youtube tutorial videos.